Cheekily greeting the crowd for the first time since his 1981 Hard Promises Tour, even Tom Petty was aware that his return the nation's capital was long overdue: "It's nice to be in Ottawa for a change," he quipped. 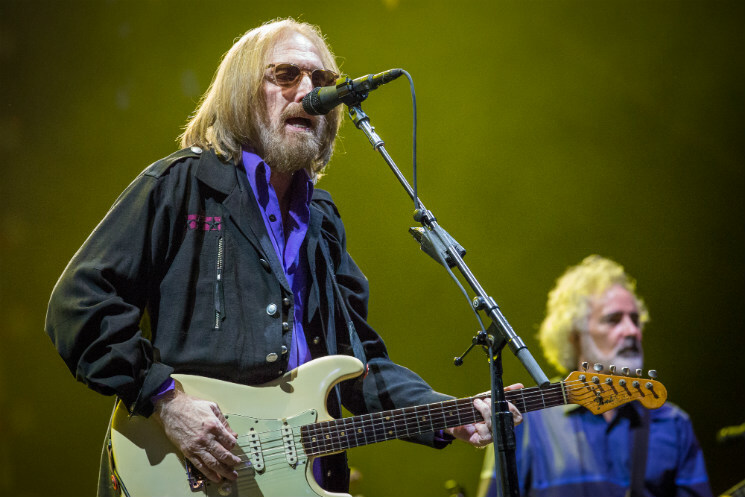 Closing out the city's sprawling ten-day Bluesfest, Tom Petty & the Heartbreakers filled the massive grounds of LeBreton Flats Park for their much-anticipated Sunday night (July 16) headlining slot. In the midst of their 40th Anniversary Tour (that curiously celebrates the 41st anniversary of the their first LP), the Florida band kicked off the evening with the fittingly chosen opening track from their self-titled debut, "Rockin' Around (With You)." Looking quintessentially laid-back and happy, Petty moved into a duo of '90s hits (including the crowd-pleasing single "Mary Jane's Last Dance" and "You Don't Know How it Feels" from his 1994 solo LP, Wildflowers), the latter of which found Heartbreakers guitarist Mike Campbell moving to the front of the stage to trade licks with Petty to provide some energy to the well-mannered audience. Informing the crowd that, "We're going to look at the show kinda like it's a huge, one-sided LP, and we're going to drop the needle wherever we want," it seemed strange that Petty and his seven-piece band (including long-time Leonard Cohen live back-up singers the Webb Sisters) would continue on with an identical setlist to the one they've been performing the entire tour. After great but satisfyingly loose renditions of "I Won't Back Down," "Free Fallin'" and "Don't Come Around Here No More," Petty delved into three more tracks from Wildflowers, including the single "It's Good to Be King" (which found Heartbreaker Benmont Tench stretching out the song behind a baby grand piano) and album cuts "Crawling Back to You" and "Wildflowers." Mostly sticking to tracks from his late-'80s to mid-'90s era, Petty invigorated the crowd with a strong performance of "Refugee" (one of only four songs from the band's first decade they would play) before closing with a too-slick version of "Running Down a Dream" that found the Webb Sisters handling the song's iconic woo-hoos. Returning for an encore that included "You Wreck Me" (the set's fifth song from Wildflowers) and "American Girl," Tom Petty & the Heartbreakers showed the massive crowd that they have enough great material and charisma to deliver a solid rock show, no matter how unspontaneous and left-field of a setlist they choose to deliver. Check out Tom Petty's back catalogue on vinyl via MusicVaultz.